Minutes away from Neon Night Market and close to various spas and restaurants, Centara Watergate enjoys an enviable location. With a mall situated downstairs, you dont have to go far to shop. Little gestures such as welcome drink on arrival will make you feel comfortable. The modern rooms are inviting while the sumptuous breakfast is a treat to feast on. Situated in one of the prime neighborhoods in the Pratunam area, the Centara Watergate Pavillion Hotel Bangkok is a great 4-star property that offers top-class services and amenities to make for a convenient and comfortable stay in Bangkok. Designed with a modern, light and inviting decor, this 4-star property is particularly liked by couples, and has been coveted as one of the top value stays in Bangkok, by guests. There are rooms suited for family stays as well and the hotel offers free stay for kids. This hotel is disabled-friendly, offering access to wheelchairs and toilets with grab rails. At Centara Watergate, guests can experience true Thai hospitality combined with modern, luxurious services and amenities, providing them with an unforgettable, pleasant stay. The hotel is connected to Watergate Pavillion Shopping Mall, adding to a brilliant, unforgettable experience for all the guests. Located in the heart of Bangkok, Centara Watergate Pavillion Hotel Bangkok is a 30-minute drive away from Suvarnabhumi international airport. Centara Watergate Pavillion Hotel consists of 281 rooms and suites. Each of these are designed with contemporary style, offering top-notch, modern facilities and amenities to all guests. The hotel offers accommodation options suited for singles, couples, families, and groups of friends/ colleagues/business travelers. Starting with the 26-square meter Superior rooms and Deluxe rooms, all rooms are equipped with the best of amenities and services essential for a great stay. For the most lavish stay at the 4-star retreat, one can opt for the Metro suite which is a huge 107 square meter room equipped with a jacuzzi, terrace and a living area. At Centara Watergate Pavillion Hotel Bangkok, all guests are treated to a fine, lavish set of services and facilities. The hotel offers free wifi access and complimentary access to computers at the hotel lobby. For those who are particular about staying in shape even during vacations, the hotel gives guests access to the fitness center with state-of-the-art amenities and equipped with provisions for weightlifting and even jogging. The hotel also offers babysitting services so that guests can make the most of their trip. Guests can also head to Centara Watergate Pavillion shopping mall for shopping. To rejuvenate and relax, guests can visit the spa, Cense by SPA Cenvaree. With provisions for singles as well as couples, at the spa, one can get the traditional Thai massage or pick from one of the many unwinding therapies or massages offered here. 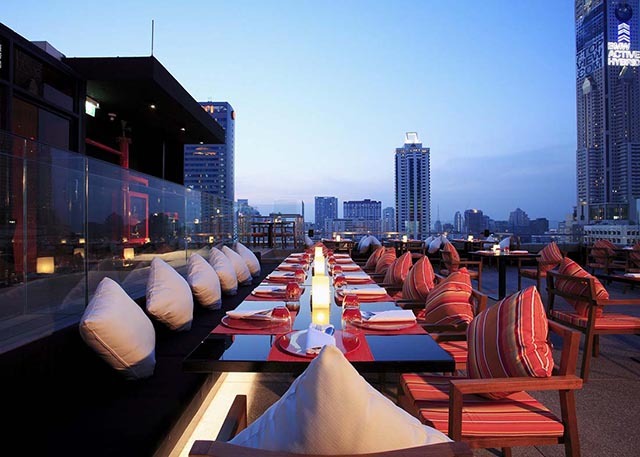 Centara Watergate Pavillion Hotel Bangkok has a lot to offer in terms of dining options. Cafe 9, on the 9th floor of the hotel, offers delectable Thai and international delicacies. This all-day dining cafe offers buffet menus with deli counters that take dining to the next level. For a versatile dining experience, one can head to Infuze, located adjacent to the hotel reception. Guests can grab snacks and refreshments at this restaurant while sipping on their cocktails. The highlight of the dining experience here, is the rooftop bar, Walk. Guests can snack on delicious delicacies and grab great cocktails while grooving along to the music played by a DJ. Centara Watergate is ideally located in one of the best neighborhoods in Bangkok. This 4-star property has a lot to offer to guests. Right from the top-notch facilities and services to the most happening options for dining, the hotel makes for an unforgettable vacation for all guests. How far is Centara Watergate Pavillion Hotel from Suvarnabhumi international airport? Does the hotel offer access to wifi to the guests? Yes, the hotel offers free access to wifi to all the guests. Guests can check-in from 15:00 hours onwards. Guests must also ensure that they check out until 12:00 hours. Are there any creche or babysitting facilities at the hotel property? Yes, the hotel services feature babysitting facilities to all guests. Babysitting services can be availed at additional costs. What activities can guests enjoy near the hotel? The 4-star property is ideally located in one of the best neighborhoods of Bangkok. The hotel is at a 100 meter distance from the wholesale market of Pratunam. Pantip Plaza and Platinum mall are also very closely located. Guests can also head to Suan Pakkad, barely 800 meters away from the hotel to check out Thai antiques on display. Centara Watergate Pavillion Hotel Bangkok is a luxurious retreat in the midst of the hustle bustle of Bangkok city. Whether it is a couple, a single traveler, business groups, families or groups of friends, the hotel has accommodation options suited for all. Designed as per contemporary standards, the hotel is rated as one of the best value retreats in Bangkok. There are many facilities and amenities for the entertainment and recreation of guests. A shopping mall in the same property as the hotel where guests can head to, anytime is one of the top highlights of the hotel. Guests can also visit the spa at the hotel to try the traditional Thai massage. There is a fitness center to cater to those who wish to stay in shape, even during vacations. The dining experience at Centara Watergate is fine. A cafe offering an all-day menu, a snacks bar next to the reception and a rooftop bar featuring a live DJ together make for an exquisite experience at Centara Watergate. Centara Watergate is the perfect amalgamation of luxury and comfort.